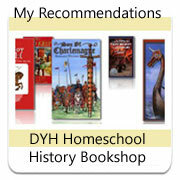 Have you used any of the Trisms Homeschool Curriculum and would like to add a review? Read what other homeschoolers say about Trisms Homeschool History Products..
Sally Barnard and I developed TRISMS for our children. It was the early days of homeschooling and there was little curriculum available. If you knew someone at a private school you might be able to get some textbooks. We wanted more for our children. We wanted to develop lifetime scholars. Students who love to learn, know how to apply what they learn to life, and to continue to utilize research and communication skills wherever they go. We went to the library and made our Wish List. We wanted more than facts and figures. We wanted them to develop the ability to think and communicate. We wanted them to view history as alive and personal, to understand the progress and sacrifice that brings us to today. We wanted our study to combine many subjects and follow a chronological and geographical progression; to study the when, where and why of a subject. We wanted our children to know how to use the library with its many sources (and now the Internet and research databases) to provide a wider base to build on. We wanted to create the need â€œto thinkâ€ and come to conclusions based on evidence and logic. TRISMS was written primarily for middle school and high school students, who are ready to discontinue rote learning and become actively involved in their education. The word education is from a root that means, to draw out, not just to put in. Nonetheless, because TRISMS fits into the unit study style it is easy to include younger students in a TRISMS setting.. TRISMS fits into many categories of learning. 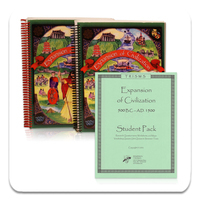 TRISMS includes the Classical approach of covering history at each division of learning  grammar, logic, and rhetoric. TRISMS includes literature from around the world, not just those classic pieces that make up our western civilization. Literature excerpts are studied in the high school volumes, with an emphasis on the literature produced by a civilization, as opposed to those written about a civilization. TRISMS believes that you may best understand history by what the people produced, so the emphasis on literature, art, music, and architecture are essential to the curriculum. Literature excerpts being studied are included in the curriculum. Should students desire to read an entire book, rather than just the excerpt, they are free to do so. Literature assignments emphasize learning from the piece, critical thinking, and incorporate the IEW (Institute for Excellence in Writing) program to create excellent writers and communicators. Students organize all the research questionnaires, timelines, literature assignments, etc. into a coursebook or portfolio. They create their own personal textbook. Similar to the Principle Approach, that gives the student ownership of what they have produced. There is a learning curve required to get started not unlike learning to drive a car. There are many steps but when they come together  youre driving. At this point the parent moves into a mentor role. Learning about resources, what type of information and where it can be found. Learning to quickly locate information using skills like skimming and scanning, reviewing the index and table of contents. Organizing time and materials. The students must adapt to their learning and organizational style. Students must take responsibility for gathering the necessary resources. Study preferences  daily study of each subject, block study, group participation. Become aware of your body clock  when are you most alert? How to ask and answer questions. (questions determine outcome) Research requires a direction. Homeschooling provides the opportunity for personalized, independent study. TRISMS is a blueprint for this model. It is designed to fit the student and family. You choose the resources, direction and time table. High school is set up in units that take roughly two weeks each. However you can be flexible. For example, if you have already studied Egypt extensively you may choose to review and move on to a time or people you are less familiar with such as the Minoans. TRISMS provides suggestions for further study in each unit. It has been twenty years and TRISMS continues to improve and expand. We get the most helpful feedback from families using TRISMS and implement them. We provide a support e-loop for our families, have a presence on Facebook, and have homework helps, co-op helps, and more information available by e-mail or telephone for all of our users. TRISMS prides itself on excellent customer support. When you add your homeschool curriculum review of Trisms - please indicate which Trisms Homeschool History Curriculum you are reviewing.